Step by step tutorial how to install Java JDK 8 in Windows 10, Mac OS X El-Capitan and Ubuntu 16. There's a ton of tutorial on how to install JDK on windows, mac os x and ubuntu. Here I wanna show you how to install JDK version 8 on specific Microsoft Windows 10, Mac OS X El-Capitan and Ubuntu Server 16.04. Every step by step tutorials is based on official JDK 8 documentation that found in Oracle web portal. 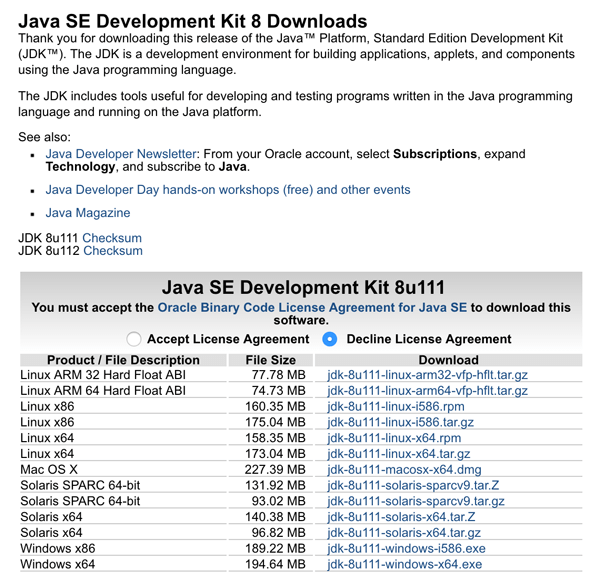 Mostly available for Windows 10 is Java Oracle JDK 8 that comes with windows installer package, here's an official http://www.oracle.com/technetwork/java/javase/downloads/jdk8-downloads-2133151.html page. Just click accept and start a download. After download finish just double click exe file then start installing by click next button few times. It will automatically install JDK to windows 10 program files. Next, I will update how to install JDK on mac os x and ubuntu Linux.